Payment is through the Paypal system -- the international, safe and secure method of paying for products. If you haven't used it before, it's an easy process, and you don't have to be 'registered' with Paypal to pay this way. (Paypal is owned by Ebay). Your credit or debit card is charged to tansy.mont@virgin.net (Tansy Productions) according to the international exchange rate on the day you pay. You receive immediate email acknowledgement of your payment from Paypal and Tansy Productions. Dispatch is guaranteed within seven working days of order. There are two main technical television systems in use around the world, the 'NTSC' system on the American continent, and the 'PAL' system, used by the U.K. and nearly all other countries. 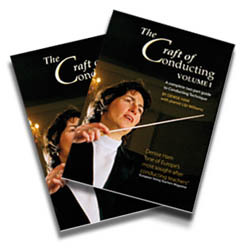 Purchase Denise Ham’s instructional DVD, The Craft of Conducting in two volumes.